Initiatives in our schools take one of two tracks. If they are planned well and led by understanding principals and leaders, they generally run well and, while there are surprises, we often get the results wanted and are reasonably happy with them. Many initiatives however are on the opposite end of the spectrum – they quickly become a burden on those responsible for implementation, a distraction from day-to-day work and simply add to everybody’s workload without any obvious benefit. These are the innovations that make every leader cringe - the project that seemed like a “good thing to do”, but actually just made work more complex and busy. If you haven’t seen an initiative like this, you probably haven’t been teaching long enough yet - they’re widespread. So why do we keep piling on more work? I believe the simplest answer is probably the correct one in most cases. We just don’t stop to look at what is “already on the wagon”. And if the wagon driver (or senior/middle leaders in these cases) doesn't say anything, nothing changes. Perhaps the senior leadership team doesn’t recognise the issue either; or perhaps its members are afraid to speak up. Either way, the silence is deafening and the wagon continues to get loaded. And, just like our picture, the “mule” ends up with all legs up in the air, incapable of getting anything done. What we needed to do before agreeing to take on any new work or project is to decide what we are going to stop doing - in effect unload the wagon! The challenge – and the point where we can minimise or avoid risk – is to have frank conversations about workload and resource management. The foundation for that discussion is clarity about what is actually going on. That means we document what is going on, including all the “next best idea” work that comes and gets tucked in behind those packages we already have on the wagon. Only discussions based on clarity of understanding about the current situation allows schools to focus on changes that will result in improvement. This requires strong, skilled leaders willing to say “no” or ask “why” of those who encourage the “piling on” approach that we’ve come to accept. “Initiativitis” is rife in many of our schools and it is vital that leaders actively manage that. Clearly, the wagon has to be balanced if is going to go places: improvement in schools demands time and space for leaders at all levels to actually do the work of change. 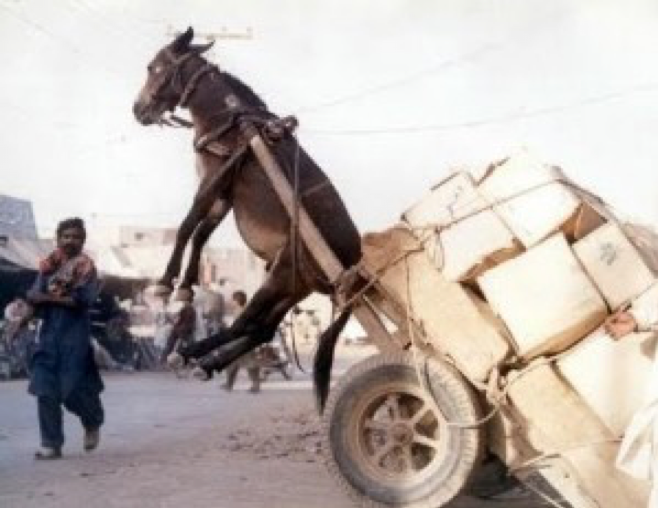 The question is: Will you turn attention to the mule the next time somebody tries to sneak another package onto your wagon?